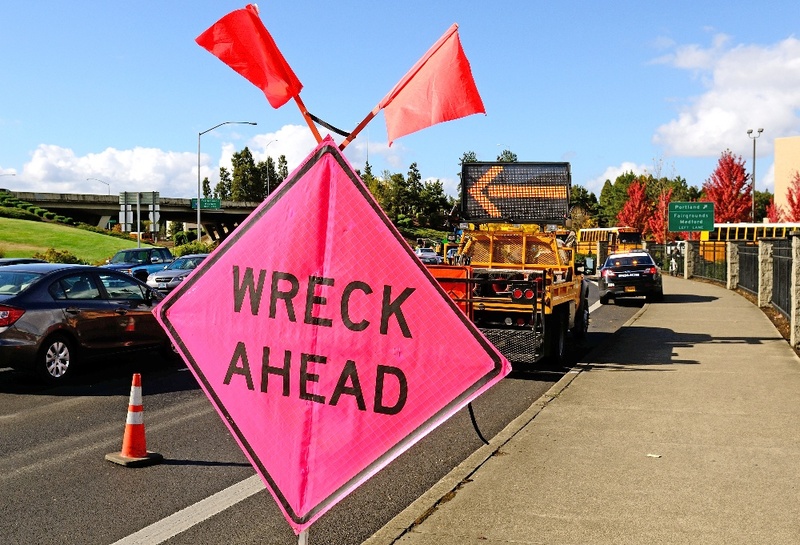 When we talk about multi-vehicle collisions, they’re usually of the three-car pileup variety. Generally, one car will stop suddenly; the car behind it doesn’t have time to stop or isn’t paying attention, and crashes into it; this causes a chain reaction, with more and more cars piling up behind the initial accident. The largest car pileup in Florida occurred on January 9, 2008, involving 70 vehicles. A brush fire had erupted off I-4 between Tampa and Orlando, covering the highway in a dense layer of fog (this will become a recurring theme throughout this story). Tractor-trailers and a tanker overturned, and vehicles crashed into one another, some trapped underneath larger ones. Despite this horrific scenario, the pileup still does not make the list of the ten largest in history. Heavy fog was responsible for this 150 multi-car collision on the A15 Motorway in the Netherlands. 64 people were injured and one was killed. England is known for fog, and a veil of it was responsible for this early morning 160-car pileup. The initial crash was caused by a truck rear-ending a tanker, with resulting passenger cars crashing behind them. 25 ambulances arrived to rush victims to the hospital, and five air ambulances were brought in for the seriously injured. Just outside Nashville, heavy fog caused three separate chain reactions, leading to one very large pileup. The accident stretched for over two miles, killing one person and injuring an additional 16. A school bus was among the wreckage, but thankfully no children were seriously injured. A fog that had been lingering for days near Battle Creek was behind this major Michigan pileup. One person was killed and dozens more were hospitalized. Fog continued to be a burden, making cleanup difficult and shutting down the highway for over a day. On the bright side, authorities report that semi-trucks involved in the accident were carrying hazardous liquids and fireworks, but thankfully the two never met. Wintry Michigan mornings are known to be foggy, and once again a lack of visibility was behind this pileup, which involved approximately 200 vehicles and stretched across Interstate 96. Sadly, two people died in the accident, with many others injured. A Sunday morning fog on Interstate 710 caused a chain reaction pileup involving 216 cars, shutting the highway down for most of the day. About five people were seriously injured in the pileup, and 45 bikers were hurt. A snowstorm caused the third worst pileup in history, occurring on the Highway at Vysocina highlands. Over six people were critically injured, and authorities wound up closing the entire highway for the duration of the snowstorm to avoid further accidents. A combination of heavy rain and excessive speed were behind this disastrous 259-car pileup in Braunschweig, Germany. It occurred on a stretch of Autobahn A2 in Lower Saxony, critically injuring 60 people. A dense fog was once again the culprit for the largest car pileup in history, occurring at the Rodovia dos Imigrantes Highway in Sao Paulo, Brazil. With over 300 vehicles crashing into one another, the accident stretched along for over one mile, with many vehicles also catching fire. 30 injuries were reported, but amazingly, there was only one death. These pileups highlight the importance of being alert while on the road, and to always use caution in foggy conditions. If you’ve been involved in an automobile or motorcycle accident of any size, you can count on the experience and expertise of the team at Lowman Law Firm to help you through this confusing time. Contact us today to tell us about your case.